Vehicle Suspension, Springs, Struts, Steering | Ball Joints and Shock absorbers | We Stop Tyre Wear | Highway Auto Electrics Rockhampton. How do I know when I need my shocks and struts replaced? After all their promises nobody stacks up to Highways 49 years of technical development in automotive mechanical maintenance and automotive technology systems. Brand new web site, click or tap here...About the best and cheapest suspension repair at Rockhampton! SHOCKS: Shock absorbers are individual components of the suspension system. These hydraulic dampening devices are designed to limit or dampen the amount of spring you will experience while driving. 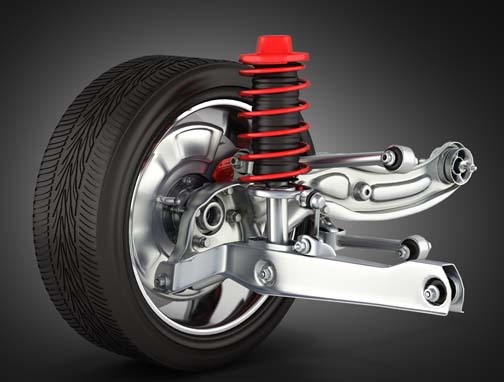 STRUTS: Struts are major structural components of your vehicle's chassis and suspension system. They act as shock absorbers and help control the up and down movements of the springs. Struts take the place of the upper control arm with the upper strut mount bearing the weight of the vehicle. Vibrating steering wheel? Hard to turn? Is it time to get your suspension system checked? Some things in life are out of our control – but your steering and suspension system shouldn't be. Having this system checked every 50,000 miles can eliminate a lot of unnecessary auto repair issues and costs – especially in relation to your safety. On top of that, keeping your steering and suspension maintained will keep you more comfortable while cruising down the road. As the stabilizer bar bushings become worn, the steering on the vehicle may not be as responsive as it once was. Furthermore, as you turn corners, the vehicle may feel sloppy and less stable than it was before. This can be a hazardous situation as you could lose control of the vehicle. Ring Steve at Highways (07)49261303 and he will talk you through what may need to be done. Rattling or clunking noises If the stabilizer bar bushings become torn or broken, the bar they are attached to will move which causes rattling and clunking noises as you are driving. These noises will be more prevalent while you are turning corners or while driving down a rough road. The noises will normally be coming from the front of the vehicle and are pretty loud. Squeaking noises Along with rattling and clunking, there may be a squeaking noise when you go over bumps. These could be mild bumps, such as speed bumps, or more moderate bumps such as potholes. Either way, a loose or broke stabilizer bar bushing can cause a squeaking noise due it being metal on metal. This should be looked at right away before it fails altogether. CV joint/boot Constant velocity axles, commonly referred to as CV axles, are the component which transfers the power from the transmission to the wheels to propel the vehicle. They have a flexible constant velocity joint which allows the axle to flex in a number of ways in order to accommodate for wheel movement created during turns, and when the suspension travels. This flexible joint is covered in a rubber boot that is referred to as the CV Boot. This boot serves as a simple dust boot for the CV joint meant to keep out dust and dirt, and keep in the grease that lubricates the CV joint. When a CV axle boot becomes damaged, it opens up the potential for the CV joint to become damaged by contamination. Usually a damaged CV boot will produce a few symptoms that can notify the driver that attention may be required. Grease/Lubricant leaking A grease leak is the first symptom that is most commonly associated with a bad or failing CV boot. Over time, with exposure to the elements a CV boot can become dry or brittle and crack or tear. When a CV boot cracks or tears it will usually leak grease onto the inside of the wheel. Often times the grease can also be flung onto the chassis or other parts on the underside of the vehicle as the CV axle turns. Often the grease will leak down the inside of a wheel and become obvious as a greasy tyre tread mark on the garage floor. A torn boot will also allow dirt, debris, and moisture to enter the CV joint, which will damage the joint and that is when it gets expensive. Vibration Another symptom of a bad CV boot are vibrations coming from the CV axle. The vibrations may be a result of moisture or debris getting into the CV joint and causing damage. Usually a vibrating CV axle will need to be replaced. Clicking noise during turns Another more serious symptom of a potentially torn CV boot are clicking noises from the axle during turns. This is a symptom that the CV joint has become loose to the point where play has developed, causing it to click during turns. A clicking CV joint will need to be replaced, as most CV joints are usually not serviceable. This is when it gets dangerous to drive the vehicle. CV boots serve a simple but important purpose and allow the CV axles and joints to stay clean and enjoy a long service life. If you notice or suspect that your CV boot may be damaged, ring Steve (07) 49261303 and he will talk you through your options and cost. Shocks and struts Vehicle struts serve a number of different purposes, including adding control to extreme handling conditions such as sudden turning and braking. They also serve to provide a level of comfort to passengers in the vehicle as they provide a level of side-to-side stability that keeps passengers and drivers from being tossed about in the vehicle. The stability that a vehicle gains from a strut is derived from a variety of factors including the weight transfer, spring rate of the strut, and the dampening ability to limit any shocks experienced. So, if your vehicle is showing signs of losing any of the above then its time to have it checked out at Highway Auto. Get a FREE evaluation with no obligation. Upper and lower ball joint Ball joints are an important suspension component found on virtually all modern vehicles. They are a spherical bearing in a socket, function similarly to the ball and socket design of a human hip, and serve as one of the main suspension pivot points connecting the control arms of the vehicle to the steering knuckles. The front ball joints allow the front wheels and suspension to move back and forth as well as up and down when the steering wheel is turned and the vehicle is traveling over the road. Usually, when front ball joints fail, the vehicle will display a few symptoms that can alert the driver that a problem has occurred. Clunking noises coming from the front suspension One of the most common symptoms of a problem with suspension ball joints is clunking noises coming from the vehicle's front suspension. When ball joints wear out they become loose and will rattle and knock as the suspension travels up and down over the road. Worn ball joints may knock or clunk when traveling on rough roads, speed bumps, or when turning. Usually, the clunking will get continuously louder as the ball joints wear, or until they eventually completely fail and break. Excessive vibration from the front of the vehicle Another symptom of problematic ball joints is excessive vibration coming from the vehicle’s suspension. Excessively worn ball joints will be loose in their sockets and vibrate excessively as the vehicle is in motion. The vibration will usually stem from the affected ball joint, either from the front or left sides of the vehicle. In some cases, the vibration may even be felt through the steering wheel as well. Steering wandering to the left or right Another symptom of worn ball joints is what is known as wandering steering. Wandering steering is when the vehicle steering drifts from left to right on it's own. When the ball joints are in good condition, and the vehicle is in proper alignment the steering wheel should stay mostly straight and is firm in response. Excessively worn ball joints will cause the vehicle steering to wander to the left or right, which will require the driver to compensate for the issue. Pitman arm The pitman arm is part of the steering component in your vehicle. It is connected to the sector shaft and moves in a circular motion with the help of the ball joint. This motion causes the wheels to move left or right, depending on which way the steering wheel is moved. It is important you have your pitman arm in good working condition because poor steering can be hazardous to you and those around you. Keep an eye out for the following symptoms of a bad or failing pitman arm. Poor steering If you notice your steering has lots of play while you are driving, such as the wheel turns more than it should before the wheels engage, then chances are your pitman arm needs to be looked at. Since this is part of your steering, the diagnostics and repair should be done as soon as you suspect steering ailments. Ring Steve (07) 49261303 and he will talk you through the solutions. Wandering while on the road Is your vehicle pulling to one side or the steering seems difficult? It is time to have your pitman arm looked at. A bad or failing pitman arm can cause your vehicle to not respond appropriately when you turn the wheel. Not only can it have lots of play, it can be highly inaccurate or seem to have a mind of its own while you are driving down the road. This can be especially dangerous during hazardous weather conditions or on a busy highway. Inability to steer When the pitman arm completely fails, you will lose all steering in your vehicle. This is a dangerous situation, so if you notice any of the symptoms above, they should be looked at before the pitman arm completely fails. If you do lose the ability to steer, do not keep driving. Slow down to a stop and contact Steve on the number above for further advice and instructions. How Long Does a Steering Rack Mounting Bushing set Last? Your car is more than likely equipped with a steering rack. Essentially, this is what translates the rotational movement of the steering wheel into lateral movement to control the front wheels. The rack is mounted under your car, behind the engine, but it cannot be attached directly to the frame/subframe, as this would cause serious vibrations to travel up the steering wheel. Instead, the steering rack is mounted using a series of bushings (steering rack mounting bushings). These are made from a combination of steel and rubber and are designed to hold the steering rack firmly in place while dampening the noise and vibration created by driving along the surface of the road. Your power steering rack mounting bushings are in use every time you drive your car. They’re also exposed to severe heat and cold, water, road salt, debris, sand and many other threats. Obviously, this takes a toll, particularly on the rubber portion of the bushings. Eventually, the rubber will become dry and brittle, shrink and crack. The steel portion can also be affected, particularly if rust and corrosion set in, or they’re damaged by an impact with an object. With all that being said, there’s no firm lifespan for your bushings. More frequent driving and exposure to the elements will lead to faster failure, though. If you notice these symptoms, it's important to have your steering rack mounting bushings inspected and replaced if they're worn or have failed completely. Ring Steve (07) 49261303 and he will talk you through the problem. Keeping your wheels aligned ensures that the vehicle drives smoothly and doesn't cause uneven tyre wear. In order to keep them aligned, the tie rod end is used. This part is connected to both the wheels and the steering gear. Keeping the tie rod ends in good working order means your car will drive as it is meant to, and your tires will last as long as possible. Wheel alignment doesn't work It may feel as though a wheel alignment is necessary on your car, but after doing one it still feels the same. That’s because the tie rod ends have to be in good working order for the wheels to stay aligned. Shaking in steering wheel If you feel shaking in the steering wheel, or vibrations, you could have issues with the alignment of the wheels. This can point back to the tie rod ends. Uneven and excessive wear on tyres You can perform a visual inspection of your tyres and check for excessive wear and/or uneven wear on the inside and outside of the wheel. This can point to a problem with the alignment of the tyres. You don’t want to let this continue as you’ll end up having to replace your tires much sooner than you may have thought. Car pulls The car may also pull to the right or left as you drive. This can be dangerous, especially at high speeds or unfavorable weather conditions. You want to be sure you have full control over the steering at all times. The tie rod ends ensure that your tyres on your vehicle stay aligned at all times, which makes for a safer and more comfortable ride. How Often Does My Car Need a Power Steering Fluid Service? The purpose of the power steering system is to ensure easy handling and precise direction as your vehicle is being driven. The power steering system assists steering by using some of the engine’s power to reduce the load you feel at the steering wheel. Using a hydraulic system, the power steering wheel works by using a belt driven pump to provide pressure. This hydraulic pressure is produced by a rotary-vane pump driven by the vehicle's engine. What power steering fluid does The power steering fluid is the hydraulic fluid that transmits the power in the power steering system. There is no definite time frame on when to change power steering fluid. The general rule of thumb that states the power steering fluid should be replaced every two years or after running the vehicle for 30,000 kilometers. Highways recommend that the power steering fluid be changed if it looks at all discoloured. Your vehicle’s user manual will give a more concrete time frame but discolouration is still the decider. Changing the power steering system fluid requires draining and flushing out the old fluid and then adding fresh power steering fluid. Depending on the type of car or 4X4, a specially designed power steering fluid may need to be used. Highway Auto will check that information before changing the power steering fluid. Changing the power steering fluid can be a time-consuming process, and it is important that it be done correctly. Highway's mechanics and technicians can change the power steering fluid quickly and easily. Ring Steve now and he will be happy to talk you through the process, his direct line is (07) 49261303. Whining noise If you hear a whining noise while turning the wheel of your vehicle, something is wrong with your power steering system. It could be a leak in the power steering pump or the fluid level could be low. Either way, the power steering pump needs to be looked at so ring Steve now for a booking (07) 49262303. Slow to respond While turning a corner, if your steering feels slow to respond to the turn you are making, chances are your power steering pump is failing. Along with this, you may hear the whining noise. If you notice these two symptoms together, contact Highways to have your power steering pump replaced. Stiff wheel Not only can your steering wheel be slow to respond, it can also become stiff during cold weather. Drive slowly down the road and turn a corner, take note if your steering wheel seems stiff. If it does, your power steering pump is on the way out. Squealing noises While whining noises normally come when you turn the vehicle, squealing noises come when the vehicle first starts up. They can happen when you make sharp turns as well, but they are more likely to happen for a minute as you start your car. The squealing noise will come from under the bonnet of your vehicle, and is a sign your power steering pump is about to fail. Groaning noises Groaning noises are the worst noises your power steering pump can make. They will get worse and worse as your power steering pump continues to fail. As soon as you notice weird noises coming from your vehicle, the steering is slow to respond, or you have a stiff wheel, have your power steering pump serviced and/or replaced. Power steering is an essential part of your vehicle and is a safety issue, so it should be taken care of as soon as possible. Your steering and suspension system consists of many parts that can be repaired individually. When you bring your car into Highway Auto, we won’t steer you wrong — our technicians perform a thorough vehicle inspection to determine exactly what repairs are necessary. We also inspect other parts – your brakes, tyres and check your wheel alignment to ensure everything is functioning correctly with this system. And before any work is started you will be provided with an estimate, so you’re in control of your car repair costs at all times. Ring Steve now on his direct line (07) 49261303 and make arrangements to have your car or 4X4 checked for any steering and suspension problems. Highways provide this service to our customers FREE of charge because we want to help you keep your vehicle reliable and your running costs to a minimum. At Highway Auto, you can trust the people who are working on your car.